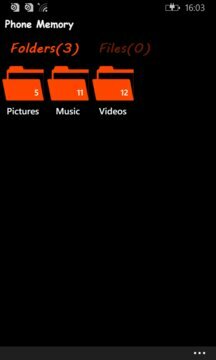 Metrotube Filemanager is a very powerful app for windows phone. It can help you manage your folders and files. 1. Feature to view common used files such as Photos, Songs, Videos, other files. 2. Feature to Rename, Share and Delete files and Folders. 3. Feature to send Image as a attachment in configured Email Id. 4. Feature to search,play and download Video Songs. 6. Feature to open Images in default view. 7. Feature to Expand the Image in Full view. 8. Feature to All Videos, and Audio file Listing.